Very lightweight and easy to hang. 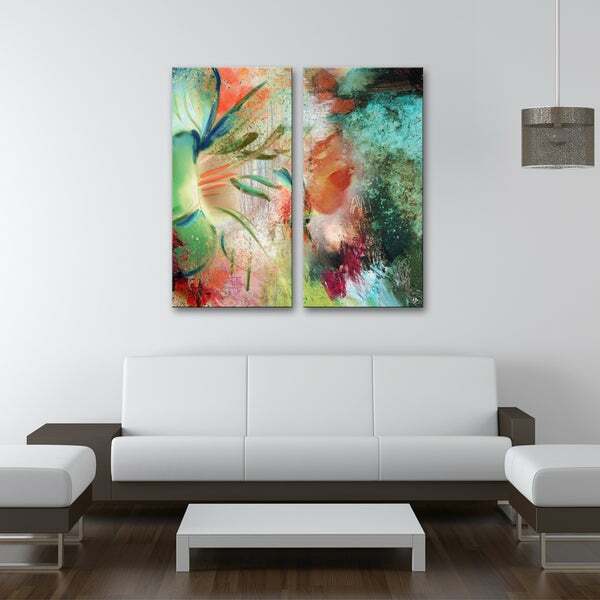 Painted Petals LIX is a gallery wrapped canvas that contains the abstract nature of flower just taking form. Blossoming into a world of complex states and tumultuous tempers, unyielding to its new environment, the flower bursts forth with glowing sheens - its petals green with wonder, its stamens red with passion. This handsome piece of wall decor will renew your house. Made in the USA from US and imported parts. Just received these 2 pieces of art and can hardly wait to hang them. I am thrilled with the colors. Perfect for my living room. One on each side of the TV. Makes all the difference in the world. My living room is no longer blah. 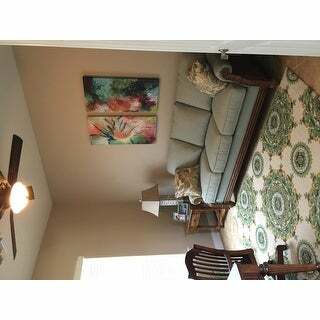 Colors are exactly as shown in photo and really adds pop to the room. Canvas is not stretched as tight as others I have ordered and moves slightly when a/c (vent below) comes on. Color of pictures look great in my bedroom, I couldn't picked a better peice of abstract art. Very nice. I'm happy with this purchase. Fast shipping. Colors beautiful and true to picture. Beautiful colors - lightweight and easy to hang.